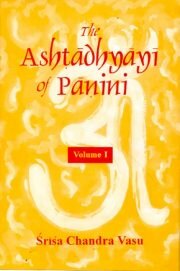 Panini`s Ashtadhyayi represents the first attempt in the history of the world to describe and analyse the components of a language on scientific lines. It has not only been universally acclaimed as the first and foremost specimen of Descriptive Grammar but has also been the chief source of inspiration for the linguist engaged in describing languages of different regions. To understand Sanskrit language, and especially that part of it which embodies the highest aspirations of ancient Aryan people, viz., the Brahmanas, Samhitas, Upanisads, it is absolutely necessary to have a complete knowledge of the grammar elaborated by Panini. Being a masterpiece of reasoning and artistic arrangement its study is bound to cultivate intellectual powers. Western scholars have described it as a wonderful specimen or a notable manifestation of Indian intelligence. This book is an English translation of Ashtadhyayi in two volumes and has won a unique position in the world of scholarship.